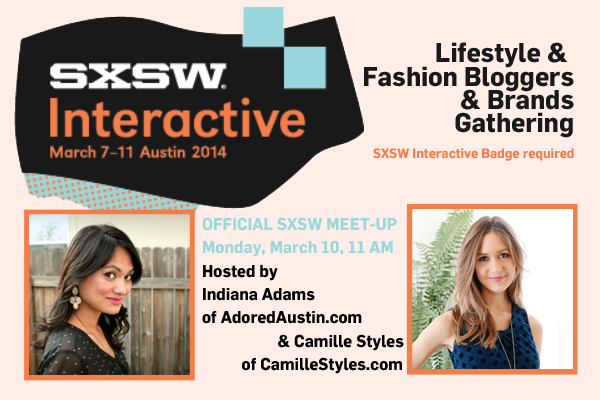 I am thrilled to announce that the two official hosts for SXSW's Lifestyle and Fashion blogger and brand meet-up are me and the incredibly talented (and super well known and popular!) Camille Styles! A SXSW badge is required to attend our SXSW meet-up, but don't fret if you don't have one. I'm hoping to gather a group of local women together to organize a mixer on the evening of Monday, March 10, too (no SXSW badge required). Save the date and stay tuned! Granted, I'll be two weeks from my due date when this all goes down, so 1- I hope the baby stays put until after, and 2- if I happen to go into labor at SXSW, I hope that we can all be couth enough to restrain the desire to live Tweet and Instagram the birth. I've already decided that if the baby is born at SXSW, I'll name her #HashtagAdams or give her the initials SX.